You've probably seen lots of recipes for Key lime pies and other sweet and or frozen key lime treats and cocktails. But what exactly are Key limes and how are they different from the limes we typically find in the grocery stores? The traditional supermarket lime is a Persian lime (despite the fact that they are not grown in Iran). Key limes (named after the Florida Keys) are smaller than the Persian limes and contain more seeds. They have a thinner rind, higher acidity, and stronger aroma than Persian limes, and are actually more popular throughout the world. Only the United States prefers the Persian limes. The Key lime's name is as deceptive as the Persian's, because they are not grown in the Keys. Most come from tropical climates such as Mexico. Key limes are usually available in the summer, from June through August. But, if Key limes are not in season, or if your local store doesn't carry them, does that mean you shouldn't make lime flavored treats? Absolutely not! The regular Persian limes will work just fine. While Key lime pie is probably the best known lime dessert, these bars have a lot of the same flavors but in a quick and easy version that can be put together in minutes. 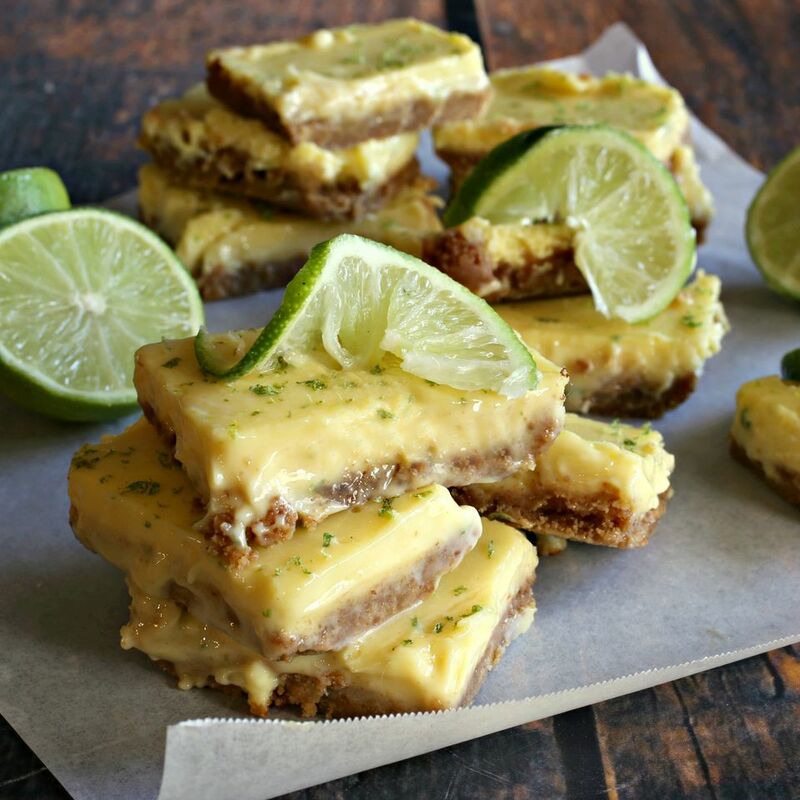 Lime bars are very refreshing and they taste great chilled. Expecting guests for a summer BBQ? Make these bars quickly in the morning and put them in the fridge until company arrives. You'll have a tasty, homemade treat with very little fuss. Add the graham crackers to a food processor and pulse until you have crumbs. Add in the sugar and melted butter. Press the graham cracker mixture into the bottom of an 8" x 8" square baking pan. Note that a glass pan works very well for this recipe. Bake for 10 minutes and allow to cool slightly, while leaving the oven on. For the lime filling: Add the egg yolks to a mixing bowl and, using a stand or hand mixer, beat for a few minutes until fluffy. Mix in the sweetened condensed milk, lime juice, salt, and lime zest. Pour the mixture into the graham cracker crust and return to the oven for 10 to 12 minutes, or until set. Cool to room temperature and then refrigerate for 4 hours. Slice into bars and serve with a wedge of lime on top, if desired.